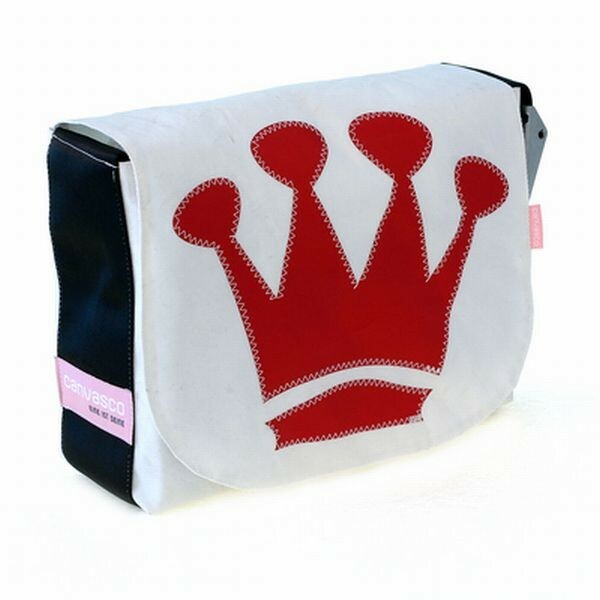 Urban bag canvas L - front lap with big red crown - white canvas. For men and women. The UNIQUE folding cover bag with Velcro closing system. Water repellent. Inside laptop compartment (15/17"); camera/cell phone pocket; bottle pocket – with 3 integrated zippers. High 12 x wide 15 x deep 5 cm the strap is 3.6" wide adjustable shoulder strap and a V2A buckle. Michael and Linda in Chinatown.